Adaptive Content: How Drupalcon 2013 Made Me Really Happy! The close of Drupalcon 2013, held in Portland, has left me with lingering, fond memories of 3,300 nerds gathered in a glowing Drupalicious camaraderie. The convention was a great success, despite the rain and ever present Wi-Fi issues. So what, you may ask, was my personal highlight? Maybe it was the tantalizing sneak previews of Drupal 8 with all its built-in mobile goodness? Perhaps it was the really excellent sessions that were provided in the brand new and much needed Education and Government track? Or, was it possibly getting my photo taken with User-1 himself, Dries Buytaert, and giving him some of our very own OSU Drupal swag? These were all great things. Really they were. But, ultimately, they all pale in comparison to the keynote address given on Day Two, in my eyes at least. This particular keynote, “Thriving in a World of Change: Future-Friendly Content with Drupal”, was presented by Karen McGrane, a world-renowned user-experience designer and content strategist who has led content projects for The New York Times, Conde Nast, and Time. In addition to spearheading projects for enormous publishing corporations, she’s also a managing partner at Bond Art + Science, a UX consultancy she founded in 2006, and she teaches Design Management in the Interaction Design MFA program for the School of Visual Arts in Manhatten. In short, this lady knows her stuff, folks. If you’re a content author, site architect, or web developer on any platform, I strongly suggest taking a peek at what she has to say regarding content structure and strategy. You will leave more informed. You might even be a little entertained. You certainly won’t be sorry. Please note that the actual keynote begins at 11:30 minutes into the video. ASOSU Elects to Use Drupal! The question, posed by ASOSU Organizing Coordinator, Drew Desilet, came to CWS in mid-February. “When it came time to look at building or buying a new voting system for the student government elections, it was clear we had two options. We could choose to buy an outside product that came pre-made to someone else’s standards and needs, or we could work with our own CWS partners on campus to build us something to suit our needs.” he explains. It should be clearly understood that the delivery of a complex, finished website or web application within a two-month timespan is a mighty tall order. Additionally, there were a few tricky specifications that the site needed to meet, one of which includes the ability to limit the voting population to a specific segment of the OSU community, namely, Corvallis campus students. The new voting site has already passed the Primary election test, during the week of April 9th – 12th. “So far we’ve had 2,118 voters run through the system without any hiccups of which to speak. Modifications for us between our first Primary election and our General election were minor, and largely administrative based. Therefore the tool the students will use will look and feel the same as the first time they used it just weeks before, however it will work even better for us as election administrators.” says Desilet. The site will be ready for use for the General election, starting Sunday, April 21st, at 10 p.m. and running through April 26th. Voting will be open to Corvallis campus students. 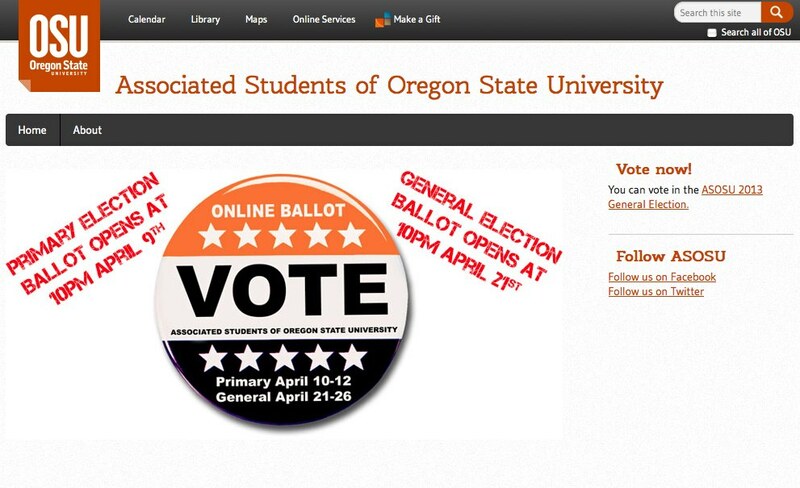 To get there, just go to http://asosu.oregonstate.edu/elections and click the big vote button. CWS is happy to present Doug Fir, the latest theme in the OSU Drupal 6 distribution. Designed by WebComm and engineered by Central Web Services, Doug Fir has been developed similarly to OSU Standard in regards to configurable theme options, integration with Google Analytics, and layout regions, but it sports a fresh, clean look which is consistent with the default theme that will be supplied in our upcoming OSU Drupal 7 distribution. The bigger advantage to using Doug Fir lies in the fact that the theme is responsive. What this means is that the display will automatically adjust, as needed, to fit the screens on your mobile devices. It doesn’t matter if your device is a tablet or smartphone, the responsiveness of Doug Fir will give you a nicely formatted appearance. Want to see for yourself how a responsive theme works? It’s really easy to do. Just go to a site with a responsive theme and resize the width of your browser window. You’ll immediately see how the layout responds. Take a look at a couple of early adopter sites who so graciously assisted us in the development of this theme: OSU Admissions and TAC (Technology Across the Curriculum).